Entrance hall: with stone tiled floor and a console table with lamps. Boot Room: a real luxury to have a separate room to take off your wellies afer a long walk on the beach! Bench seating and plenty of space to store coats and boots. Sitting/Dining Room: beautifully presented room which has two distinct areas: one for sitting and one for eating. The sitting area has a large corner sofa and 2 armchairs, an electric flame-effect fire, a large rug over the wooden flooring, coffee table and a freeview digital TV with Sky sports package and a DVD player. The dining area is tastefully designed with pale wooden furniture and has French doors which open out onto the paved terrace. There is a dining table with 10 chairs, an armchair and a console table. Kitchen: a contemporary high quality kitchen which has been carefully planned to ensure that guests have all they need to cater for a full house. The bespoke kitchen has cream-painted units with granite work surfaces and has been extremely well-equipped with a built-in electric oven with an induction hob, 2 fridges, freezer, a built-in combination microwave, built-in dishwasher and built-in washer/dryer, with high quality Dualit appliances and Denby crockery.. There is a small kitchen table with 3 chairs which is handy for young children. The stairs are not steep and there is a wooden hand rail on both sides. On this floor there are 3 en-suite bedrooms. All of the bedrooms are generously sized and all are beautifully presented with each having an individual style and a unique look. Unlike many houses, all of the bedrooms have been designed as if they were the master bedroom and no guests should feel as if they've got "the short straw". All of the bedroom furniture and bedding is hotel quality, with white bed linen, fluffy towels and comfortable mattresses and pillows. Please note that some of the duvets and pillows are natural down-filled and some are hypoallergenic, to ensure that guests have the choice. Bedroom 1: lovely room at the front of the house with sea views. There is a super king-size bed, bedside tables and lamps, a tallboy and a dressing table with chair, plus a dressing area with plenty of clothes storage space. There is a large en-suite bathroom: with bath, a separate walk-in shower, hand basin, WC and a heated towel rail. Bedroom 2: beautifully presented with a king-size bed, bedside table and lamps, dressing table and chair, tallboy, armchair, and a hanging rail. There is an en-suite shower room: with walk-in shower, twin hand basins, WC and a heated towel rail. Bedroom 3: a pretty room at the front with sea views. It has painted furniture and twin beds, bedside tables and lamps, a tallboy and a wardrobe. There is an en-suite shower room: walk-in shower, hand basin, WC and a heated towel rail. Bedroom 4: lovely room which is beautifully presented. It has a high pitched ceiling with an attractive feature lampshade. There is a king-size bed, bedside tables and lamps, wardrobe, a dressing table and chair, tallboy and a wooden chest. Bathroom: has a bath with a hand held shower attachment, vanity hand basin, WC and a heated towel rail. Games Room: has lovely sea views and a high pitched ceiling with "fishing net" feature lampshade. It's the perfect place for younger guests to retire to with a sofa bed which may accommodate an additional 2 guests, pool table, TV, PlayStation, selection of books and games. There is a chest of drawers on the landing. There is the advantage of Wifi throughout the house, plus the use of a landline telephone on an honesty box basis..
For those staying with children, please note that there is a highchair, travel cot and stairgates available if required. There is parking in the shingled drive at the side of the property. The garden is fully enclosed and has been landscaped with a paved terrace with garden furniture, a charcoal barbecue and space for 10 guests to dine alfresco. There is a lawned area with a variety of shrubs and plants. 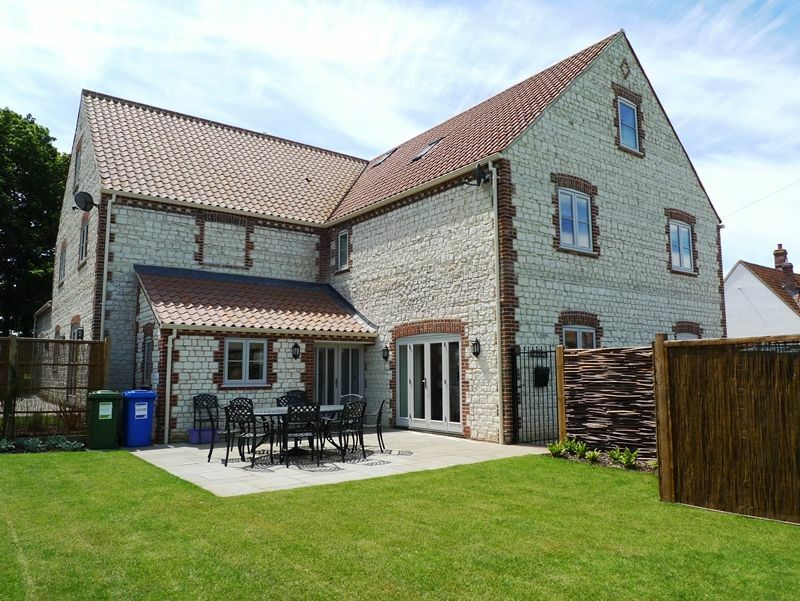 Conveniently located within a short walk of the Norfolk coastal path and close to the excellent local places to eat, plus Thornham's childrens' playground, tennis court and deli/cafe. Please note that well-behaved dogs are permitted to stay, but must remain downstairs. Tennis Week in August - please note that the security deposit for Willow Lodge is £500 (rather than the standard £250).